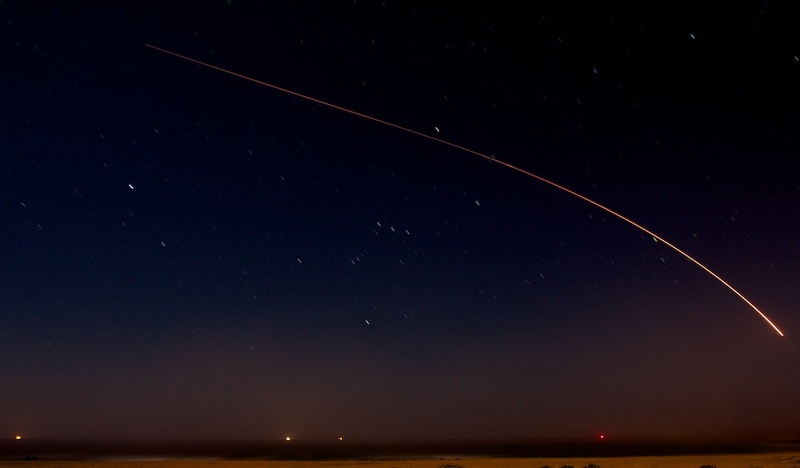 "I've been trying to capture a rocket launch from Vandenberg for almost a year now," writes Thomas Emmerich. "I finally got my chance tonight, and it came out pretty good for my first try. I almost missed it by mis-judging the launch angle from Ventura (CA)." "Rocket Launch" - Grab Shot 213 by Thomas Emmerich. Click on image for larger version. "I had to move the camera at the last moment and missed the first few seconds of the launch. The hard part about taking these shots is you can't see anything in the viewfinder while setting up, and then once you open the shutter, you can't tell where the rocket is in the frame or if its even in the frame. There are no second chances." "I used my Canon T2i with a borrowed Canon 17-40mm F4L lens. Settings were F/8 and bulb mode with a infrared remote trigger to start and stop the exposure of 95 seconds. ISO 400. I found tips on photographing rockets at night by doing a Google search for 'Photograph Vandenberg Rocket Launch'". There was quite a bit of water vapor in the air, which was made visible by the long exposure and the parking lot lights behind me. This is our 213th Grab Shot! Wow. If you want to review the collection that began back in 2006, go to our Grab Shots page. Thanks Derrick for posting my photo. A few people pointed out to me that the rocket's path went through the Orion constellation in the center of the photo. Yes indeed Thomas. That's one of the reasons why I like the shot! I thought I'd point out that if you want to be able to see rocket launches from the various sites in the US checkout http://spaceflightnow.com and/or follow @spaceflightnow on Twitter for launch info. Be prepared for disappointments as launches are frequently delayed or postponed due to issues. Not fun when you're waiting at the beach on a cold night and then nothing happens.